Permanent-electro magnetic systems, the definitive answer to any clamping need. 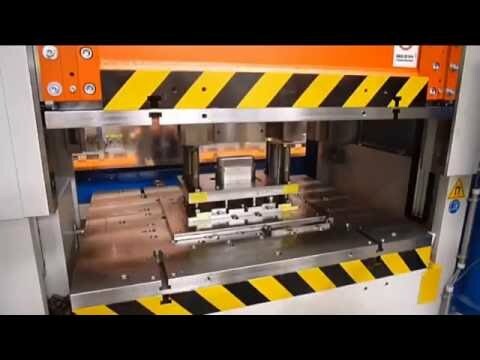 Innovative systems for milling, mold-making, grinding and turning. Flexible tools to handle different loads in maximum safety. A complete range of magnetic equipment to answer your production needs. The convenience of the magnetic force at your service StampTec is the magnetic system for quick clamping of press dies for metal dieing. With StampTec, downtime to fix clamps, make adjustments or tests between one production batch to another is eliminated. StampTec is suitable for dies of any shape and size, without any modification. Created with 2 magnetic modules, it is easily installed, secured on pallets, adapting to any type of machine, without any modification. The Grip function allows fixing StampTec to machine systems using the magnetic force in combination with fixing screws. It is thus used to create a homogeneous set between the die, the magnetic system and pallet, provided with absolute rigidity, to reduce vibration and deflection of the die and ensure a die with a high accuracy and quality. Quick and easy StampTec locks dies of any shape and size with strength. Drastically reduces die changeover times (up to 90%) compared to a conventional procedure. A single operator easily and safely performs the operation, without working inside the machine. Convenient It does not require any changes to the dies. Working with StampTec means eliminating the cost of maintenance and management of brackets, consumables, fasteners. Safe An electro permanent system: an electrical pulse activates the system in a second (MAG): The die is held by the natural force of the permanent magnets. The clamping force remains constant even in the absence of a power supply: Don’t be preoccupied about power outages. StampTec is “error-proof”: The control systems installed supervise the operation and in the case of failure stops the press. Demagnetization is permitted only with the top section in the “standstill” position: Impossible to remove the die with an open press. Reliable It is a monolithic construction: Machined from a solid and has a fully metallic surface; no wearing parts. On the surface of the magnetic module, mechanical references may be formed to speed the positioning procedure. StampTec is available in 2 configurations: STG – with a GRIP effect (37 mm thick) and ST (46 mm thick).